Mira® Pro™ is now a native 64-bit application that continues to provide research caliber image calibration, data reduction, visualization, and measurement tools in a highly integrated, easy to use environment. Application areas: Astronomy and space science research, education. The standard 64-bit edition of Mira Pro utilizes the 64-bit memory space and provides faster processing than 32-bit software. As a native 64-bit application, it requires 64-bit Windows or 100% compatible platform. The 32-bit legacy edition of Mira Pro remains available by request. It runs on both 32-bit and 64-bit Windows and utilizes the full 32-bit memory space. Mira Pro™ offers the professional researcher or educator class-leading tools to do it easier, faster, and better in a 64-bit native software application. Mira Pro includes an extensive collection of richly integrated, easy to use tools for image visualization, precision measurement, and data reduction. On the other hand... if you need even more tools and scripting capability, see 32-bit Mira Pro Ultimate Edition or the 64-bit version with more features and a scripting language, Mira Pro x64. One year of maintenance is included; after one year, discounted annual maintenance is available to provide tech support and keep your software current. Improved and enhanced Express Calibration tool, a powerful yet slightly simplified version of that provided in Mira Pro x64. New chart package for creating presentation graphics (in addition to the standard Plotting package). New command to modify keywords (add, change value, and rename) in image headers. New command for specifying the type of region statistics to be measured (useful, for example, to compare alpha-clipped mean and standard deviation with those for ordinary mean, median, sigma-clipped, or several other estimators). New single-keystroke commands work with the image cursor to make measurements and plots (shortcuts). Mira Pro makes it easy to make research quality photometric measurements of any number of stars with any number of standards on any number of images. Doing ensemble photometry, plotting light curves, importing objects from target lists, and reporting results are a snap! 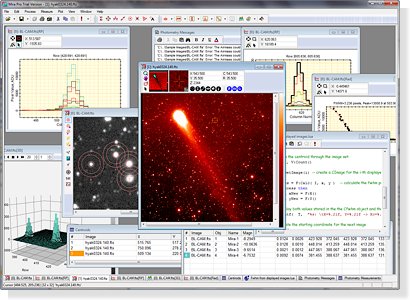 Use Mira Pro as a powerful, general-use tool for astronomical research, including areas like variable star research, exo-planet search, milli-mag level photometry, supernova patrol, minor planet detection and rotation, and data mining. Provides powerful tools for astronomical data reduction and visualization. Mira Pro is also great for analyzing 2-D and 3-D numerical models and simulations. Excellent for synoptic studies involving measurement or analysis of photometry, coordinates, distances, angles, brightness, and other parameters. Mira's outstanding GUI puts advanced tools where you expect them, freeing you to think about science, not using software. Utilize Mira's superior visualization and analysis tools to get more from image data and numerical simulations. Realize complex data reduction strategies using simplified, intuitive commands and procedures. Measure science-grade coordinates, distance, angles, FWHM, statistics, magnitudes, and more, in image units and FITS World Coordinates. Work with FITS and other standard image formats using 8 to 64-bit numeric data (integer and real pixel types) plus 24-bit and 48-bit color. Note to IRAF users: Why Mira ? How good is your FWHM? Educator Bundles: Bundles a Mira AL x64 site license with Mira Pro, ideal for teaching and curriculum development! Also available for Mira Pro x64 + Mira AL x64. Windows XP SP3, Windows Vista, Windows 7/8/10 (64-bit), or 100% compatible Windows environment on Linux or Mac. Hard Drive Space: 100 MB.